The agreement was aimed at ensuring that Tehran's nuclear program "will be exclusively peaceful" in return for the lifting of sanctions. The Iran nuclear deal, formally known as the Joint Comprehensive Plan of Action, offered Tehran billions of dollars in sanctions relief in exchange for agreeing to curb its nuclear program. 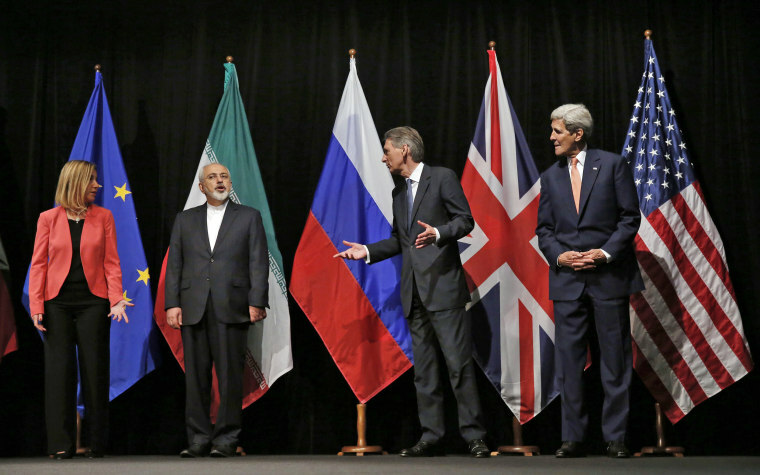 The agreement was aimed at ensuring that "Iran's nuclear program will be exclusively peaceful." In return, it lifted U.N. Security Council and other sanctions, including in areas covering trade, technology, finance and energy. The deal was sealed in July 2015, under President Barack Obama. Tehran acceded to a 10-year restriction on nuclear production, agreed to shut down thousands of centrifuges and exported almost all of its bomb-making material. Under the agreement, Iran agreed that "under no circumstances will Iran ever seek, develop or acquire any nuclear weapons." Iran also allowed a strict monitoring regime, permitting international inspectors to gain access to sites suspected of nuclear weapons-related activities. The agreement did allow for a commercial nuclear program "for exclusively peaceful purposes." Iran signed the agreement with the five permanent members of the U.N. Security Council — the U.S., Russia, France, China and the United Kingdom — as well as Germany and the European Union. Why is the deal controversial? As of May 2018, there was broad consensus that Iran has abided by the agreement. Israeli Prime Minister Benjamin Netanyahu, however, has alleged that "Iran lied" about its nuclear weapon ambitions in the 2000s, although the information he shared seemed to match up with what nuclear inspectors had already reported about Tehran's program. Critics also allege that the deal itself is flawed and does not prevent Iran from engaging in aggressive actions that fall outside the pact’s purview, such as pursuing a ballistic missile program and expiration dates on some restrictions, as well as extending its influence throughout the region. President Donald Trump has made no secret of his dislike for the agreement, calling it “the worst deal ever” while on the campaign trail. On May 8, 2018, Trump announced the U.S. would reimpose sanctions on Iran, leaving other nations involved scrambling to salvage the pact. On the other hand, some experts see the Iran nuclear deal as a good scenario for denuclearizing North Korea. While the two cases are “very different,” Iran offers lessons to those involved in similar negotiations with North Korea, according to Suzanne DiMaggio, a senior fellow at New America, a Washington think tank where she directs a long-running U.S.-Iran policy dialogue. “The process of diplomacy that the United States pursued with Iran could offer some insights on how to begin engagement with an adversary whose leadership is extremely distrustful of the United States and vice versa,” she wrote in a post for the Arms Control Association. Regional U.S. allies, such as Saudi Arabia and Israel, are vehemently against the agreement, saying it has not worked to curb Iran’s aggressiveness or ambitions. Some of Iran's policies in the Middle East run counter to U.S. interests and those of its allies. Tehran threatens Israel, backs Hezbollah — a powerful Lebanese militia and political group — and is involved in conflicts in Yemen, Iraq and Bahrain. The Trump White House has also been critical of Iran for its support of President Bashar al-Assad during Syria's seven-year civil war. How widespread is support for the deal? Other countries that signed the deal with the U.S., including allies France, Britain and France, called on Washington to stick to the agreement. German Chancellor Angela Merkel has also defended the pact, saying that an imperfect deal is better than no deal and that her country will "watch very closely" to ensure it is being fulfilled. Iran's Foreign Minister Javad Zarif says the deal is "not negotiable."